Position Sensor is designed for hydraulic cylinders. Linear Position Sensor mounts completely inside any cylinder and can be configured to cylinder strokes beyond 4 ft. It is virtually immune to shock and vibration, and does not exhibit end-of-stroke dead zone. Sensor is 2.25 in. high x 2.4 in. in diameter, and utilizes precision mechanism that couples translation of hydraulic cylinder to non-contacting sensor element. The sensor is about half the size of a soda can (2.25" high x 2.4" dia. ), and utilizes a precision mechanism that couples the translation of a hydraulic cylinder to a non-contacting sensor element. Installation method allows cylinder designs to remain virtually unchanged and the sensor is easily integrated into a high-volume hydraulic cylinder production environment. 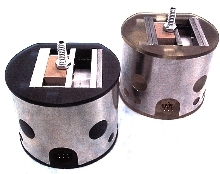 The first release of the sensor will accommodate cylinder bores of 3 inches and over, and stroke lengths up to 4 feet.